Huge Savings Item! Free Shipping Included! 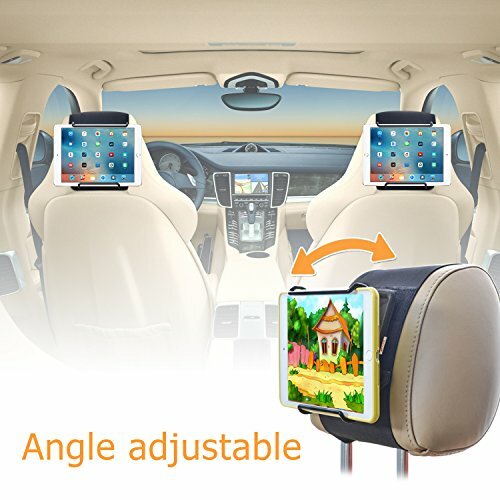 Save 17% on the Car Headrest Mount Holder TFY Universal Car Headrest Mount Holder with Angle Adjustable Holding Clamp for 6-12.9 Inch Tablets - 2 Pieces by TFY at All Seven Seater Cars. MPN: TFY-8tablet_blk_X2. Hurry! Limited time offer. Offer valid only while supplies last. WORKS WITH OR WITHOUT CASE - Tablets may be installed with or without protective cases or covers fitted. DETACHABLE - Tablet clamps attach securely and detach easily for maximum in-vehicle convenience. Children quickly learn how to mount and remove their Tablets on their own. PORTABLE & TRAVEL FRIENDLY - Components fold up compactly for easy stowing in your vehicle when not in use. Car mount carries easily in a travel bag or purse for use in rental vehicles or another car. Headrest Mount can be fitted to airline seat back tray tables, turning your Tablet into an inflight personal video system.